Mars Express last performed a close flyby of Phobos on March 7, 2010, passing by the moon at a distance of about 170 miles (278 km) and returning some great images. Previously believed to be a captured asteroid, it’s now thought that Phobos may actually be a chunk of Mars itself, reconstituted bits of the surface that were blown into orbit by a large meteorite impact…a theory strengthened by the discovery of phyllosilicates in Phobos’ composition, a substance known to exist in abundance on Mars’ surface – but not in asteroids. 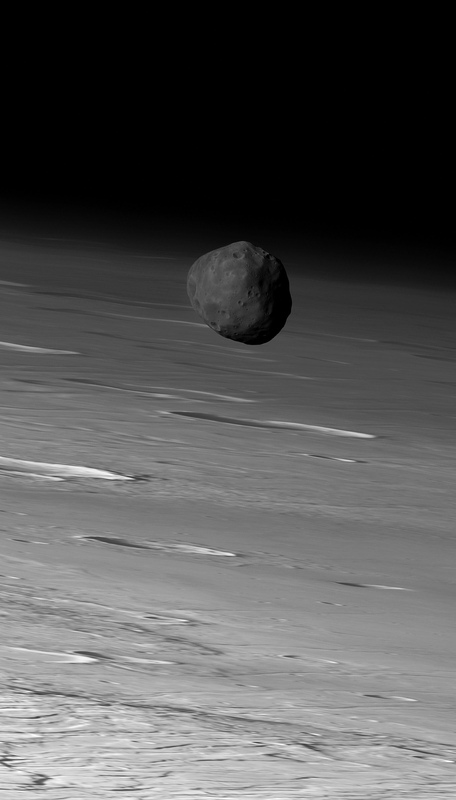 The Russian space program is planning a mission to Phobos next year with their Phobos-Grunt spacecraft, which will land on its surface and return a sample back to Earth. Thanks to peter59 (Peter Masek) for sharing these images from the release, which looks to hold a lot more goodies…read more at The Planetary Society’s blog! Image: ESA / DLR / FU Berlin (G. Neukum). What an amazing shot! Phobos looks as though it is right up close to Mars, almost as if, if you were standing on a high mountain, you touch it.